Given how often my Top 10 Tips for Academic Writing get retweeted, promoted and Googled, you would have thought I would have jumped at the possibility of doing #AcWriMo (Academic Writing Month, which happens in November) again. After all, I have done it in previous years, and learned a lot from doing it last year. But this year I decided I wasn’t doing #AcWriMo. The reasons why might surprise you. First of all, as a matter of disclaimer, I hereby declare my undying love for #AcWriMo. The mere idea, having one single month where we dedicate ourselves to attempt (crazy as the idea may be) to achieve lofty scholarly writing goals, is a brilliant one, and I salute Charlotte Frost for coming up with the idea. Even some accomplished academic writing changed their mind about #AcWriMo (Inger Mewburn of The Thesis Whisperer), recently enthusiastically supporting it. So no, I didn’t skip on #AcWriMo because I didn’t like the idea. I LOVE IT. I just had a number of reasons to skip it this year. I outline them below. 1. I already write every day. I didn’t feel the need to add increased pressure to my already super busy schedule. I built into my calendar a daily writing routine. I write for 2 hours every day, normally, and when I can’t, I at least schedule 30 minutes per day, in 4 sessions of 30 minutes whenever I can. 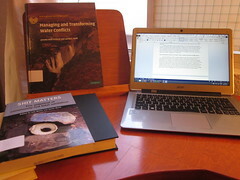 Given how much I have travelled recently, I have had long spurts where I have had a chance to write (transcontinental flights are wonderful for this). 2. I have been travelling way too much. This year is probably one of the busiest I’ve had. I was in Europe twice in the past couple of months for brief appearances and talks at international workshops, and in Asia in the summer, plus South America last month. Wonderful trips, but overwhelming for my regularly planned life. Time zone changes, food regime shifts, everything changed in the past 6 months, and therefore I wasn’t about to add pressure on myself to try and binge-write. I got sick in between trips (as I was coming back to Mexico from Uruguay and Argentina, and heading to Portugal). 3. I can’t cope with additional pressures. My health is first. If you read my weekly template you will see that I schedule naps, down time, eating at regular intervals and exercise. I know that if I am to be a productive academic, I need to be healthy. I got sick in between international trips (as I was coming back to Mexico from Uruguay and Argentina, and heading to Portugal). I have subjected my body and brain to extreme pressure this year and doing #AcWriMo would have added pressures my physique would not be able to take anymore. 4. This end-of-the-year is insane already. I’m closing the year with a bang, with two co-authored manuscripts that need to get out because my coauthor and I are already behind for the peer review process. Plus, I’m organizing a workshop on Mexican environmental law. Remotely. In Mexico City (I’m based out of Aguascalientes, 7.5 hours by bus or 1 hour plane away from Mexico). Doing #AcWriMo would have simply put me brought me to the brink of insanity. We don’t need that, do we? 5. I’m not crazy about binge-writing and prefer daily writing routines. This is, again, not an indictment of #AcWriMo, but a reflection on what works best for me. Ever since I wrote the daily writing routine into my schedule (thank you Tanya Golash-Boza for those tips), I am less and less of a fan of binge-writing. Attempting to do all the writing you didn’t do during the year in one month is a bit insane. #AcWriMo is a fantastic idea, but it doesn’t always fit me. It did, however, help me to kickstart my daily writing routine. 6. I’m decently pleased about my writing quotas this year. I wrote 8 manuscripts this year, published one, edited 3 chapters of my book, and sent just about everything I presented at a conference except two papers out for peer review. Given my history with conference-paper-to-journal-article conversion, I am pretty pleased that I stopped holding on to manuscripts and just sent them out for review. I still owe my coauthor and two book editors 4 manuscripts, but I feel confident I will be able to complete them as I already have drafted them. Because I always follow the advice of Jo Van Every, on her recommendation I read Boice’s 1990 book on professors as writers. 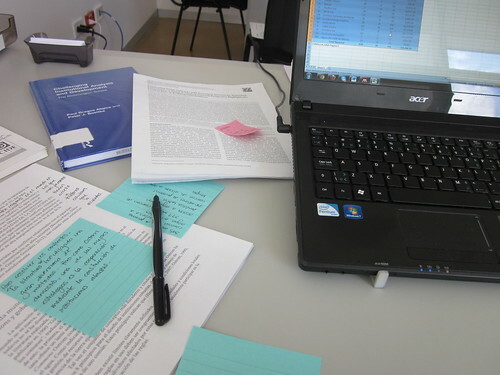 Boice does scholarly research on academic writing motivations, procrastination and efficiency. Even before reading the book I learned that I needed more discipline for my writing. I incorporated what I have learned in the past few years, and I have disciplined myself to write every day. Every. Single. Day. Tagged with academic writing, AcWriMo.